Swing by Kuzbara with family and friends this Christmas Eve and treat your tastebuds to a festive feast. Enjoy the cena di natale with a special four-course menu featuring calamarata pasta with shrimp and a selection of josper oven mixed grilled fish from chef Enrico Bartolini, set to the sounds of resident DJ Nikola. Look no further for your vespera de natal (that’s Portuguese for Christmas Eve) celebration than Abu Dhabi’s most popular churrascaria restaurant. Think 16 different cuts of eat continuously on offer, a turkey carving station and a sumptuous salad bar, with a live Latino band providing a soundtrack for the festivities. Mark the night before Christmas with special holiday-inspired additions to the famous Latin American menu at Coya. Guests can enjoy three festive dishes, including spit roast chicken, grilled flank steak, and beef fat roasted potatoes. There’s also a quirky twist on the popular yule log, this time with passionfruit, cherries and sorbet. Transport yourself to an elegant under-the-sea world at Sayad, which means ‘fisherman’ in Arabic, and enjoy a five-course set menu featuring the finest in seafood. Book a table at the outdoor terrace for a beautiful view of the Arabian Gulf. Seafood is top of the menu this Christmas Eve at Olea, the gorgeous restaurant at the St Regis Saadiyat Island Resort. The festive buffet also offers carving and rotisserie stations and a stunning array of desserts. It’s a Festaggia di Natale at the Hotel Sofitel Abu Dhabi Corniche. Select your favourite antipasti, paired with a special set menu. 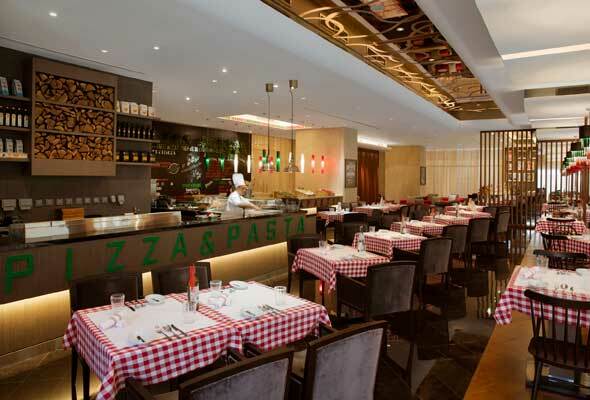 Abu Dhabi’s newest Italian joint is located at the Pearl Rotana and it’s hosting a Celebrazione festiva- aka Christmas Eve dinner – featuring a set menu, with a la carte options available.